Road transportation is critical to economic activities and plays a dynamic role in marketing products and providing citizens with easy access to points of contact for business activities, health, education, and agriculture. Road geometric features, such as horizontal and vertical alignments, gradients, and superelevation rate, are essential data for transportation studies. 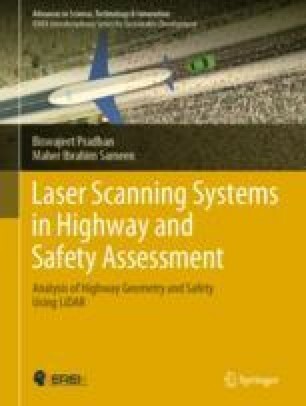 Recently, laser scanning systems or LiDAR (Idrees and Pradhan 2016, 2018; Idrees et al. 2016; Fanos et al. 2016, 2018; Fanos and Pradhan 2018; Abdulwahid and Pradhan 2017; Pradhan et al. 2016; Sameen et al. 2017; Sameen and Pradhan 2017a, b) have been identified to be the most efficient way of road corridor surveying and extracting geometric road features. Unlike satellite and aerial images, LiDAR provides accurate and dense point clouds that allow the rapid mapping of the topography of a given area in a relatively short time.